Anton Fitzgibbon straightened his tie for the third time since he looked into the mirror. He fussed with the vest on his three piece suit and took in a deep, nervous breath. 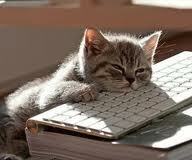 As an internet cat, he worked hard and dedicated himself to doing the best job he could. He dreamed of one day having the prestigious corner office of the Chaircat of the Internetz, but he was still a long way from that lofty position. He started his career as an intern, received a full-time offer in the mailroom, and steadily worked his way up the ranks and into the front office. Anton looked forward to one day sitting in the Chaircat’s office rather than simply walking by it, but for now he had enough responsibility on his shoulders with his first managerial assignment. Cats lived in an advanced civilization hidden from the eyes of humans. Much like the mythical Prometheus, cats deigned to share their vast knowledge with humans but only did so in small amounts at a time so as to not overwhelm their lesser senses. Throughout the ages, cats had shared electrical circuits, internal combustion engines, and other technological marvels with the humans who so amused them and dedicated their lives to catering to their every feline whim. The cats were even gracious enough to let the humans think that they invented these devices well beyond their capabilities, much like a parent who told her child that his crude crayon sketch was an artistic masterpiece on par with the works of the great masters. Anton supposed that the Classical Greek myth of Prometheus was an endearingly flawed human attempt at articulating the racial memory of the cats that initiated and guided the progress of human civilization. The internet stood among the greatest achievement developed by cats, centuries ago when humans barely began the Renaissance. Cats had long since developed superior forms of communication such as the Overmind and the UberHive that rendered the internet beyond obsolete. Humans, however, had only several centuries later become ready for the internet so the cats decided to keep its more advanced replacements away from them so as to not overwhelm their small minds. Cats thus kept the internet running for human use, which Anton found a tedious task due to the system’s archaic structure that belonged in a museum rather than on active use on human computers. Despite the internet’s age and functional limitations, or perhaps because of them, the internet required significant hard, boring work to administer functions that would be trivial tasks even on the Overmind, not to mention the UberHive. Anton sighed and reminded himself that he did this all because of his affection for humans, being such amusing and affectionate creatures. 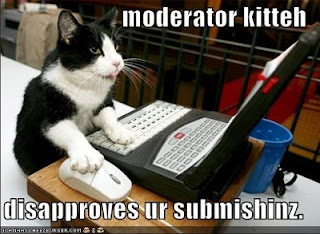 The downside, however, was that few cats wanted to do this kind of mind-numbing work so the Chaircat’s cabinet had to hire cats on a contract basis to do repetitive, thankless work. Most cats considered themselves above such tedium so those who were willing to do this kind of work often needed plenty of guidance and supervision to stay on task. 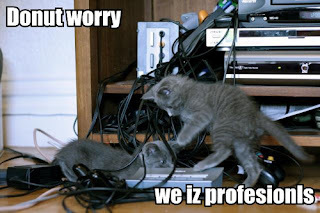 The cats in charge thus hired project managers to oversee the assignments to keep the internet running, lest there be an outage that would drive humans into dysfunction and despair, and Anton now had his first managerial task. Anton recalled the human phrase “like herding cats” that he found an apt metaphor for the arduous tasks of getting cats to cooperate and produce even the semblance of professional work product. He sighed and considered this a test of his leadership skills that would serve in his career aspiration to become the Chaircat. His team included the Warrior Cat who never stopped boasting, quite loudly, about his many adventures, Mr. Kitten and Twitch who spent more time fighting when they were not instant messaging each other rather than working, and CC the Chapterhouse Cat who spent half of his days, if not more, curled up and sound asleep. Anton’s two best workers were Ting Ting, who he only had on a temporary basis because she had a contractual commitment to return to her home story to meet a tragic fate, and Blondhilda, who was a defictionalized Norse Goddess who was only in cat form until she could break the evil Enchantress’s shapeshifting spell. Anton shook his head and thought that it figured that his two best employees with the strongest work ethic were the ones destined to leave the project in a short time. Cats had perfected cloning technology back in the Ice Age, but company policy prevented Anton from going that route despite his strong temptation. Anton remembered that a true leader worked with what he had rather than what he wanted. He tried to lead by example and communicate the rules and attributes of success to his team members, but none of them had any interest. If CC and the Warrior Cat could not even fill out their time sheets correctly, then how could they do a proper job of keeping the internet running? Anton had to spend more time watching them than he did doing his own work, which he supposed came with the territory. He tried his best to tune out their complaints about the boredom of work and the difficulty of waking up in the morning and coming in to work. Anton kept his own schedule and kept his eye on his ambitious goal to rise up the feline ranks, but he struggled to figure out how to convey that sense of pride in his work and motivation to his subordinates. He repeatedly admonished Mr. Kitten and Twitch to get back to work when they spent too much time goofing off and distracting the rest of the team. Why couldn’t his entire team consist of Ting Tings and Blondhildas? Why could they not follow their example as well as his own? At times like these, Anton’s silent frustrations helped leaven his nervousness on his first managerial assignment. He supposed that he would look back upon this down the road and laugh when he played with the Newton’s cradle, actually invented by a cat of course, on the polished mahogany of the antique desk in the Chaircat’s corner office.